THIS is a romantic love story with mature adult appeal that has moments of deep tenderness and pathos. Dustin Hoffman plays the role of Harvey Shine, a multiple loser who has frequently lost (or failed) his chances of finding happiness in the past. Threatened with losing his livelihood, he opts to attend his daughter’s wedding in London where he is humiliated at the rehearsal dinner by his daughter (Liane Balaban), who tells him that she would prefer her stepfather (James Brolin) give her away. A failed jazz musician and composer, Harvey now works as a commercial jingle writer in New York and loses his job by his decision to fly to London, when he arrives too late to catch his return plane. Emma Thompson, playing the role of Kate, has the unenviable task of collecting statistical data from airline passengers who clearly have more interesting lives than her own. He is settled into his remorse; and she has found comfort in her loneliness, being constantly reminded by a nagging mother (Eileen Atkins) of her loveless and forlorn “situation”. Not surprisingly, both Harvey and Kate find themselves accidentally sharing drinks next to each other at a Heathrow bar, and they begin a conversation, tentatively and edgily at first, that slowly makes a connection between two wounded people. There is a big age difference between Kate, an attractive late-40-ish woman, and Harvey, a clearly ageing (70-ish) depressive, and one asks the question whether this is an attraction that will last or even work. One never knows what the blossoming relationship between them will come to. Here, we have two consummate performers who have wonderful acting skills. Harvey’s and Kate’s personalities bounce off each other, the process being helped, of course, by their witty repartee and intelligent conversation, which shows us an escalating freedom in what both can yet decide to do with their lives. Harvey’s job is offered back, but he refuses to return to New York so that he can “chance” it with Kate. Kate decides to “chance” it with Harvey, but she is uncertain about where this relationship will end. For Harvey, at least, this may well be the last chance he has. Emma Thompson never loses her dignity in her portrayal of Kate, and Dustan Hoffman plays the role of Harvey shrewdly. Harvey’s reaction to the almost total exclusion by his family of any visible sign of respect is conveyed non-verbally with finesse; his hesitancy is studied, but shows growing signs of need. Both Thomson and Hoffman capture effortlessly the humanity of their character’s lonely situations. Although one doesn’t quite know why they were attracted to each other at the start, they use the shared misery between them to develop their relationship with great sensitivity, warmth and charm. Had the movie been a better vehicle for what they each can bring to their role, it might have been more satisfying, but their journey together is well worth watching and sharing. 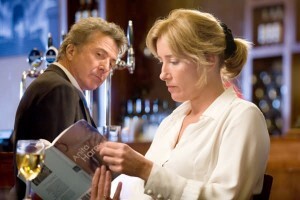 Joel Hopkins directs the movie with style, and it is difficult to see how he could lose with two such classy performances from Dustin Hoffman and Emma Thompson. The musical score tries to push the film into sentimentality, but the quality of the script pulls the viewer back with witty and nuanced exchanges between the two main characters that stay in one’s mind. The film’s plot-line becomes increasingly predictable, but the calibre of the acting partially overcomes the problem. Overall, this is a film that is highly entertaining. It fluctuates insightfully between comedy and pain, and stresses the importance and value of human contact between two people, who want to find happiness once again after having been disappointed many times in the past. It deals with lessons in life that convey both poignancy and truth in human relationships. The film should appeal to many, and not just to those who feel lonely.